Brubaker posted a 3.63 ERA and a 30:72 BB/SO ratio in 89.1 innings over 15 starts in his junior season at Akron. Those numbers were an improvement over 2014, when he had a 4.02 ERA and a 37:45 BB/SO ratio in 71.2 innings. As a freshman, he made 14 starts and had a 7.25 ERA. His fastball sat at 91-92 and topped out at 94 mph, and relies heavily on a changeup. He also threw a slider. He had room to add muscle, giving him more projection than many college draftees. And, in fact, by 2017 he was often sitting at 94-96 mph, sometimes reaching the upper-90s. In 2018, he added a curve that appeared to make a difference for him. Brubaker wasn’t on Baseball America’s top 500 prospect list when the Pirates drafted him. He signed right after the draft for $46,500 below the slot amount. Brubaker got off to a rough start at Morgantown, with an ERA of 6.04 in his first five outings. After that, his ERA was 1.41. Brubaker didn’t miss a lot of bats, but he got lots of groundballs, walked very few, and allowed only three HRs. Despite the low K rate, he led the league in WHIP. Of course, that was due to a .250 BABIP that probably isn’t sustainable. 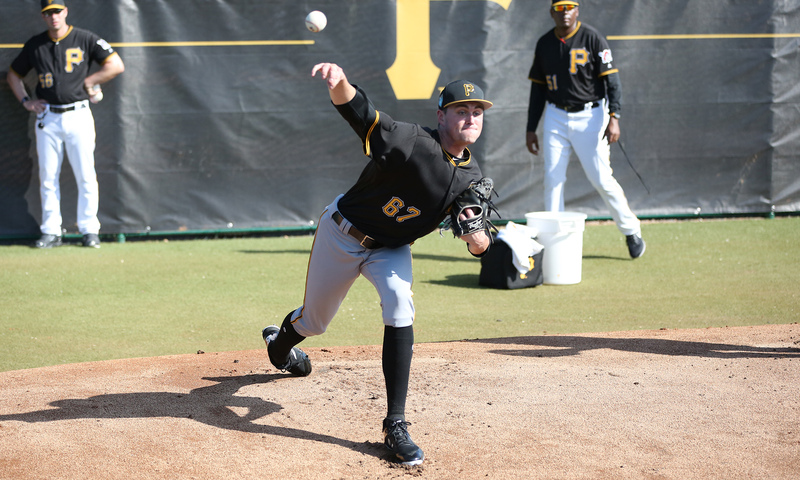 Considering his draft round and how he pitched in his debut, Brubaker seemed like a candidate to move up to Bradenton, as Tyler Eppler and Chad Kuhl did for their first full seasons, but the Pirates sent him to West Virginia. Brubaker pitched well for the Power, striking out a lot of hitters. One negative was gopher balls, as he allowed one every seven innings. The Pirates moved him up after a dozen starts and he struggled at Bradenton. He pitched decently at first, but things really went south in August, when opponents posted a line of 342/395/466 against him. Most disturbing was the fact that his K rate was half what it was at West Virginia. Brubaker was a flyball pitcher at both levels and extra base hits were a problem all season, as shown by his opponents’ slugging average of .452. Left-handed batters had an .862 OPS against him for the whole season, and right-handed batters managed .727. Brubaker didn’t appear ready for AA, but the Pirates moved him up to Altoona and he spent the season in the rotation. He pitched largely the same as he had at Bradenton, showing good stuff but still getting hit hard much of the time. Opponents batted 291/355/397 against him, although some of the trouble was a high BABIP of .348. His xFIP of 3.79 was better than his ERA. He had less trouble with gopher balls, allowing 40% fewer in exactly the same number of innings as the previous year. He pitched very well in his one playoff start. Through 2017, Brubaker’s results didn’t seem to match his stuff, but that changed in 2018. He got off to an outstanding start at Altoona and the Pirates promoted him after six starts. He got hit harder in AAA and got uneven results in May and June, but in July he started pitching better. In five August starts he had a WHIP of 0.79 and ERA of 1.01. For the entire season, Brubaker had a large platoon split, allowing an OPS of .805 to left-handed hitters and just .609 to right-handed hitters. Brubaker was eligible for the Rule 5 draft in the off-season and was added to the 40-man roster. At worst, he could be a very good reliever, although the Pirates are resistant to moving young pitchers to the bullpen. June 9, 2015: Drafted by the Pittsburgh Pirates in the 6th round, 187th overall pick; signed on June 12. November 20, 2018: Contract purchased by the Pittsburgh Pirates.